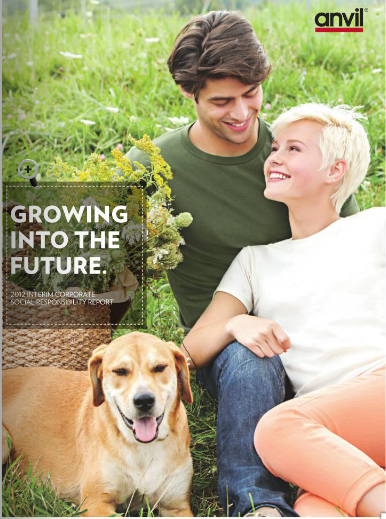 January 17, 2013 /3BL Media/ - Anvil’s 2012 Interim CSR Report, “Growing Into the Future,” presents the company’s progress and results for the 2011 fiscal year with regards to Anvil’s three CSR pillars: social, product and environmental responsibility. The report outlines the company’s continued support for US organic cotton farmers as well as overall reductions in waste and water. Anvil also details its collaborations with educational systems in the US and Central America to inspire students to participate in environmental conservation efforts. Reduced Water in Manufacturing: Anvil’s major textile facility decreased water consumption per pound of fabric by 15% compared to 2009 by improving steps in the dyeing and bleaching processes. Decreased Overall Waste: Anvil recycled 67% of overall waste due to extensive recycling programs at all facilities, such as sending cardboard yarn cones to the biomass boiler which is then turned into renewable energy at Anvil’s textile facility. WRAP Certified Facilities: All three of Anvil’s Central American facilities were audited and certified by Worldwide Responsible Accredited Production (WRAP). For more information visit www.anvilcsr.com. Anvil Knitwear Inc. is a leading sustainable apparel and sportswear manufacturer serving the printwear and private label markets with its AnvilOrganic(tm) and AnvilSustainable(tm) brands. Anvil Knitwear is a wholly-owned subsidiary of Gildan Activewear Inc., one of the world's largest vertically-integrated marketers and manufacturers of quality branded basic family apparel. Anvil is one of the largest domestic purchasers of US grown organic cotton and has been consecutively ranked as a Top Ten Brand Using Organic Cotton by the Textile Exchange since 2009. Anvil offers 66 styles of activewear and accessory products including t-shirts, caps and towels. For more information visit www.anvilknitwear.com and www.anvilcsr.com. More from Anvil Knitwear, Inc.